When I teach my Global Branding seminars, I like to spend some time tackling issues related to city branding. Cities are, after all, brands. Cities compete with other cities for tourists (customers), investment, and have large budgets to craft their brand images. From a marketing perspective, there is a lot of value in understanding city brands as well. Consider how much value L'Oreal would lose without being L'Oreal Paris, or how much equity a commodity like coffee would lose without its link to the mountains in Colombia, or how much tourism San Francisco gains (or Detroit loses) because of its brand image. Montreal is a North American city with a Euro-chic joie de vivre. It's the city where the imagery includes beautiful people (especially women) who are fashionably dressed, sipping French wine (maybe even a cigarette) on a cobblestone sidewalk terrace. The city's vibrant joie de vivre energy spawns from the city's world-class festivals and events (the world's largest jazz festival, world's largest comedy festival, Francofolies festival, Grand Prix Formula 1 racing, and the world's largest annual fireworks competition) and this Euro-chic and vibrant joie de vivre energy mesh to form the Montreal brand image. Blend in some cultural icons like the seemingly divinely-inspired Notre-Dame Basilica, the 2nd most winning sports team in professional sport (the Canadians) and the oldest university in the nation (McGill), and you have institutions that give a gravitas to the city's joie de vivre. Having a great brand image helped Montreal win "Best Global Destination" in 2011- an award handed out annually by tourism professions (comprised of editors from Lonely Planet, Tourism and Leisure etc) around the world. According to Tourism Montreal, $2.25 billion dollars were injected into the Montreal economy in 2011 as a direct result of tourism. You don't need to be a politician, marketer, or economist to realize that this translates into many jobs especially for hotels, restaurants, taxis, clubs, and souvenir shops. One of the things that I track when I work on projects for my clients' brands is who's saying what. One way of doing this is to see what's trending. The online chatter/buzz can be looked at as a leading indicator. Let's take a look at the top three online stories about Montreal over the last 3 months. Headlines linked Montreal to a violent confrontation between a taxi driver and violent drunken "mob". Remember this ugly story? A taxi driver while in his car, was being attacked by an unruly, drunken mob who were outside of the cab. Apparently, the group of drunks did not want to pay the $9 fare. 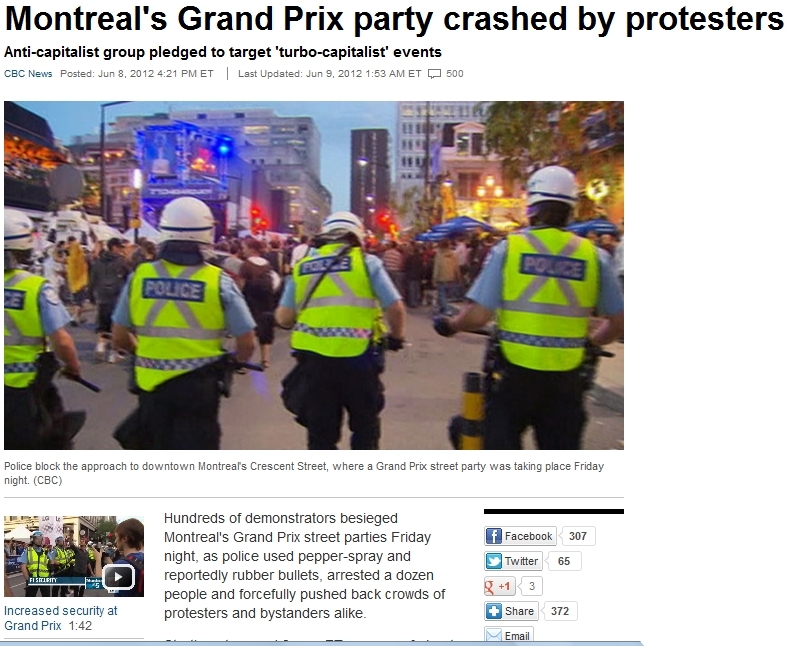 What is unusual about this event is that the Montreal taxi driver drove over one of the attackers. The whole thing was captured on multiple iPhones by witnesses who quickly uploaded the videos to YouTube and MetaCafe. Within hours, the violent event had "gone viral" around the world and been picked up and shown as a top news story on broadcast news programs on every continent.Check out some of the headlines on the left: "Disturbing video showing man being run over. Montreal taxi driver charged. 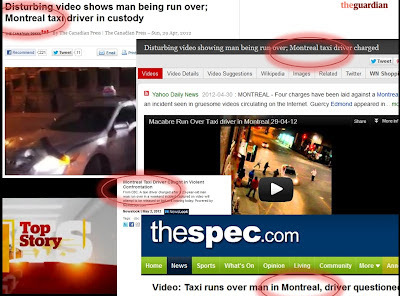 "; "Disturbing video shows man being run over; Montreal taxi driver in custody." If the taxi driver story is ugly, this story gets the unflattering award for being far more unsettling. A Montreal man (Luka Rocco Magnotta) killed, dismembered, performed acts of necrophilia, cannibalized and mailed the dismembered body parts of his Chinese lover (Justin Lin) to government officials and elementary schools. 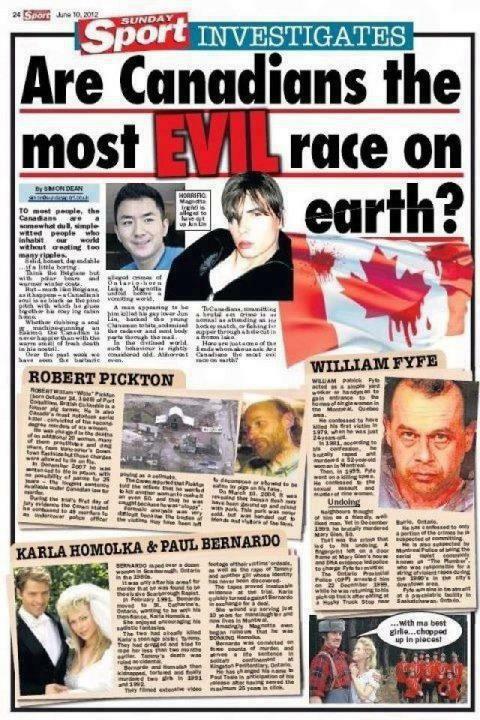 The savage ice-pick murder (and other aspects) were filmed by Magnotta who also posted his grotesque crimes on various social media web sites. While many of the posted videos have since been removed due to their content, the news story linking Montreal to a psycho has reached hundreds of millions of people around the world . The story continues to be covered on broadcast and social media as details of the case continue to be released. 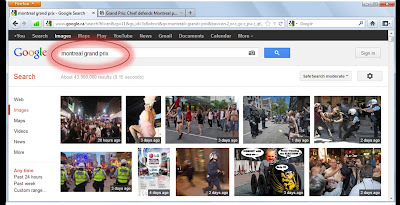 If you searched "Montreal Grand Prix" on Google during this year's Formula 1 Grand Prix, you'd want to see pictures of roaring Ferraris and champagne being poured over a Grand Prix winner, right? Sadly, here is what you will see: pictures of students (who are protesting tuition hikes) vandalizing property, and mocking cops using nazi-esque salutes, and Montreal police officers using force and pepper spray to pacify offending (and many non-offending) students. The visuals speak for themselves. It's not just broadcast media that is delivering stories that wound the the "joie de vivre" brand. Shared media is filled with the negative stories. 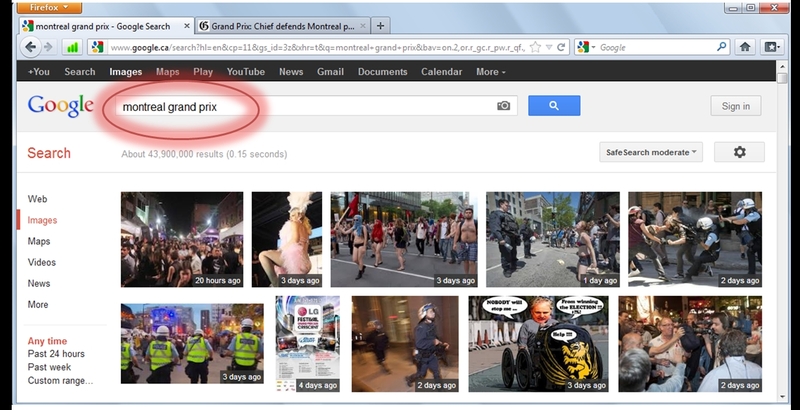 For example, typing "Montreal" in a YouTube search delivers "Montreal student protest 2012", "Montreal student riots", "Montreal killer" and "Montreal cabbie". Clearly, the search is not delivering the feel good returns associated to the Grand Prix, Jazz Festival, Just for Laughs, or the Notre Dame Basilica that "The Best Global Destination" folks saw. Instead, Montreal is faced with the sobering reality the joie de vivre association has been damaged. The economic impact can be significant. For example, if only one in twenty tourists who are planning a trip to Montreal decide to go somewhere else, Montreal would lose about $110 million dollars in direct tourism dollars. In other words, that is the equivalent of 1 million $110 dollar restaurant meals. For the past 3 months, YouTube has been delivering more bad news videos about Montreal than positive videos. Cities are brands- and many of the bad news recovery marketing lessons learned in corporate settings can be applied to city brands. There is a lot of evidence in the marketing literature that posits that if one bad news story is heard about a company, it takes 5.5 good news stories- of equal weight- just to neutralize the negative news. This suggests that Tourism Montreal has a lot of recovery work to do. If brand Montreal were my client, I would offer the following recommendations. Firstly, I would act promptly to launch a brand rehabilitation strategy. The longer the negative stories simmer in the minds of tourists (and potential tourists) around the world, the greater the negative impact on brand Montreal. 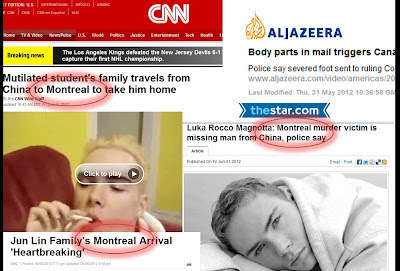 And ,it is highly likely that there is more bad news to come from the Magnotta (e.g. Lin's missing head) and student protest stories. Secondly, and more importantly, the existing bad news needs to be drowned out. The Internet has a perpetual memory so the negative stories are not going away any time soon. Therefore, a simple, consistent, and integrated campaign that reaches potential Montreal tourists at critical tourist touch-points would be in order. Think of the communications impact if the next wave of 2012 festivals- Jazz Festival, Just for Laughs, and International Fireworks Festival - integrated the same brand narrative on Montreal in each customer touch-point. If constructed properly, the brand narrative- and integrated campaign - will return Montreal to its joie de vivre image. In addition, if done effectively, the integrated campaign will internally align the citizens of Montreal to fulfill this image- reducing potential antagonisms between students and police. Vive joie de vivre. Vive the tourism of joie de vivre Montreal.